Does regular movement keep joints lubricated, or does regular movement dry out joints in time leading to wear? After a good 20 years of jogging on and off, I've stopped that now because I could start to feel shin splints and hip pain and I'm all too aware that my father and his brother have both had hip replacements. I now walk anywhere from 8-15 miles daily, albeit slowly. No problems with hips or shins, but I just wonder if the body wears out like a machine? 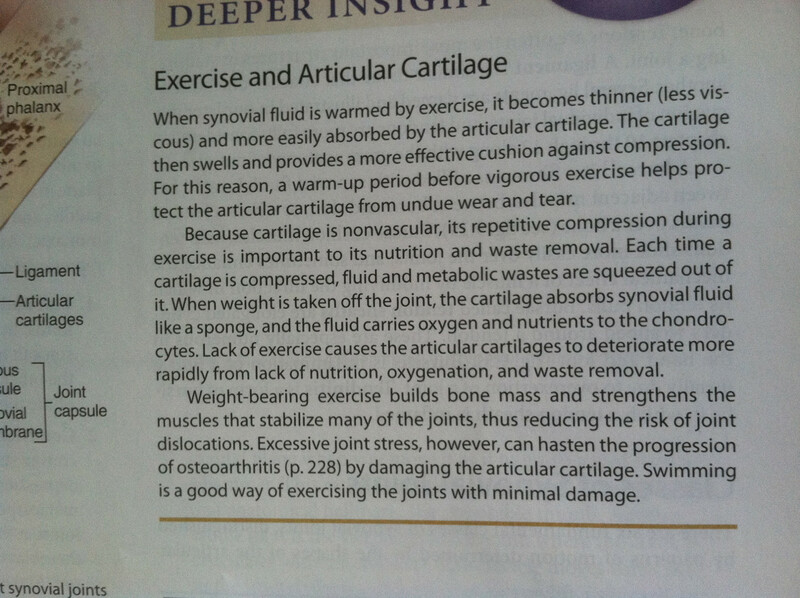 Great, [synovial] fluid seems to do everything. Maintains your joints, lubricates them and even helps with shock absorption. So where's the problem? Synovial fluid depends on the movement of the joint in order to circulate and perform its function. Imagine the cartilage in your knee is like a dirty sponge sitting in a container of water (synovial fluid). The sponge just sitting there isn't going to get cleaner but if you keep squeezing and releasing, the water circulates and the sponge gets a lot cleaner. The same thing happens in your joints. Furthermore, a lot of joint problems come from muscle weakness or imbalance and improper movement mechanics. If you are having joint problems then you want to make sure to address any flexibility or mobility issues in the joints. Improve muscle strength and balance. Reduce sedentariness and avoid any painful activities. For shin splints, improving ankle mobility, calf flexibility and hip activation (Specifically the hip rotators like glute medius) should help. Make sure you aren't ramping up your training load too quickly - tendons, same as muscles improve their capacity over time. Joint movement is essential to the joint's health as the synovial fluid bathes the cartilage and nourishes it. Think of the synovial fluid as "oiling the joint". High impact can be detrimental to the joint surfaces because of the pounding and compressive forces on the cartilage. Running over many years, esp. if you have any alignment problems, or muscle imbalances (weakness or tightness) can lead to degenerative changes as one side of the joint gets more compression than the other. Given that you describe shin splints and hip problems, a physical therapist's evaluation of your alignment and lower body muscle strength and tightnesses could help. They can give you an appropriate exercise (strengthening, range of motion and stretching), and a self massage program (tennis balls and/or foam roller) to address your individual problems. They can also test your hips and advise you whether or not you should see an orthopedist. Also, don't overlook good shoes and joint supplements. You may also like Nordic Walking Poles to give you a better walking workout. They add trunk and upper body muscles exercise at the same time giving some protection to your lower body joints. Good luck. This is a tough question to answer and requires a lot more information about body mechanics than I have. But as for my experience, it's the impact that destroys joints, not merely the motion. This is why low-impact trainers such as elliptical, rowers, and exercise bikes are so popular. If you are having hip pain consider sleeping with a pillow between your legs. Not the answer you're looking for? Browse other questions tagged running exercise walking joints or ask your own question. Will soda negate any effects from exercise? Would riding kick scooter wear out your shoes?